You mean, the burgers don’t look as good as they do in the ads?? 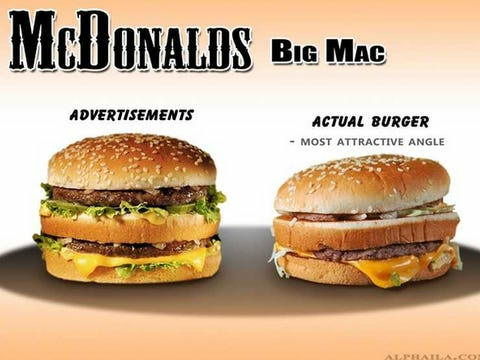 Someone has discovered and proven with photos that fast food looks better in the ads than in real life. Years ago, I knew a bunch of genuine NYC foodies — not just people who like to cook but people who cover food in the media and promote certain brands in advertising. Surprisingly, I could eat with them without their tearing every entree to shreds in well-reasoned attacks. Some were food stylists, who make food look its yummiest in ads and on TV. When you realize that a vanilla custard cone is artfully sculpted shortening due to the need to withstand the effects of hot lights and the drip, drip, drip of a million needed re-shoots, you realize anything is possible. Your idea of a Big Mac won’t quite match reality. Yet The Big Mac may still be a tasty occasional meal, as long as you don’t overdo it. Anyway, here is the link for the advertisement vs. reality comparison. The source blog is Alphaila.